Autumn is almost here! My favourite season! In Alberta, we get chillier weather, beautiful, crunchy rust, bronze, and golden coloured leaves that fall everywhere, cozy knitted sweaters, chic patterned thick scarves, warm soups, and of course, pumpkin spice (and everything nice). Very stereotypical, but still, some of my favourite Autumnal things! What are things that remind you of Fall? 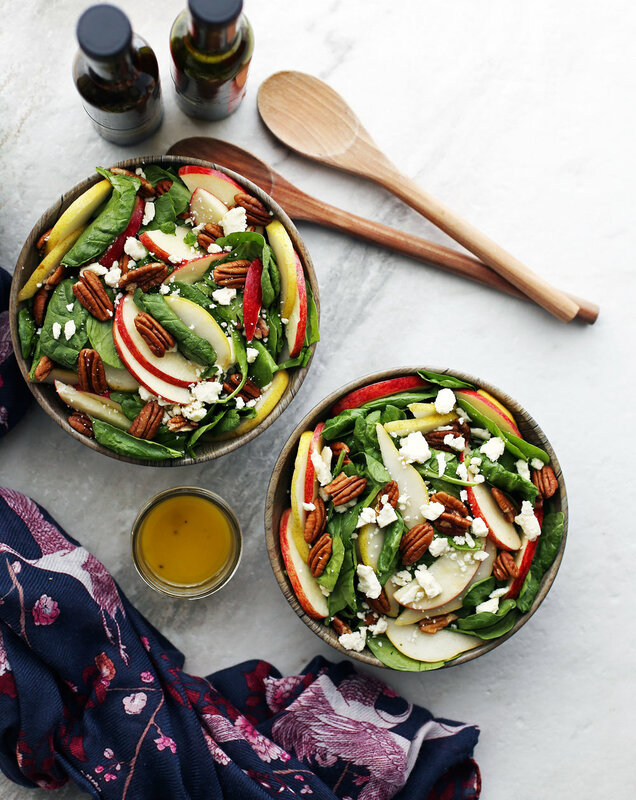 A salad may not scream fall-time, but it has slices of fresh seasonal Bartlett pear and sweet Gala apple that taste so wonderful this time of year. The green, red, and brown colours in this salad remind me of the season. This colourful salad is filled with tasty sweet and salty flavours that go so well together. Crispy, sweet Gala apple, soft, juicy Bartlett pear, creamy, salty feta cheese, and crunchy pecans. I have a tough time describing the flavour of pecans, but people have described it as rich, buttery, nutty and almost maple in flavour. 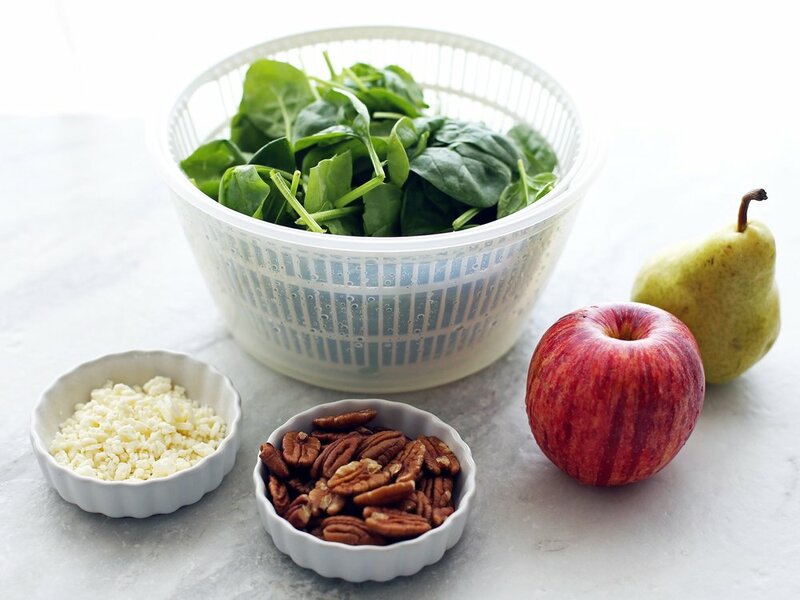 Everything is mixed with nutrient-rich and mild tasting baby spinach, which makes up the bulk of the salad, but the spinach takes a backseat to the other flavourful ingredients in this salad. The salad ingredients! Amounts listed in the "Ingredients" section below. Whisk together all the dressing ingredients or place in a small mason jar with a tightly-secured lid and shake until well-combined. Toss the apple and pear with lemon juice (to prevent browning) in a large bowl and then add in the rest of the salad ingredients. Pour vinaigrette on top and toss to coat. Eat it as light meal or serve it as a side dish. Of course, since this is a salad, it's easily customizable. You can always add more or less ingredients to this salad. Then there's the easy vinaigrette. The lemony tart and lightly honey-sweetened olive oil-based dressing has a wonderful zing from the fresh ginger that is whisked into this simple vinaigrette. When tossed in this fresh salad, the light dressing doesn’t overpower the other ingredients, but rather enhances the flavours. I hope you enjoy this recipe! If you make it, I'd love to hear what you think. I used a Gala apple and Bartlett (Williams) pear in this recipe.